I'm going to Washington state soon, so I may not be posting often, but here's some things I liked in the past week. 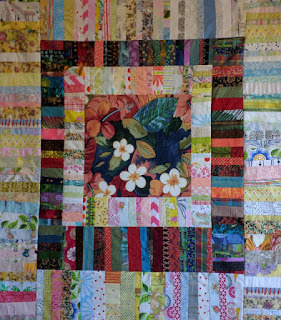 First off, I'm liking quilts that are being posted from the Sisters' Quilt Show. Love this one also - would use the idea, not copy per se. I need to live to be 150 years old to get all these inspiring quilts done. And then there is this scrappy string work (may have come from the Fret Not Yourself blog). What a great way to use up those strips. Have been indoors almost all of the past week. We're in another scorcher period of time. Thankfully the peak of this heat wave was only 114 - but all the other days were in between 104-110. Ughhh. Hope it is cool wherever you are (or warm if you're south of the Equator). Do go over to Lee Anna's post of goodness for the week. Bye for Now. I'd like to go to that some time!